Microchipping dogs is now the law, but microchipping cats is optional. That said, there are many reasons why microchipping a cat is so important and why all cat owners, regardless of whether their cat ventures outside or not, should consider it. A microchip is a small computer chip that acts as an internal identification tag containing information linking your cat to you. Microchipping your cat is a quick and easy procedure, carried out by a vet, that feels like any other injection. While it may cause minor discomfort for a second or two, your cat won’t need anaesthetic as the chip is only skin deep. Your cat gets lost or is ‘adopted’ by another family, or stolen. Your cat is found ill or injured and is taken to the vet for treatment. Your cat is tragically killed on the road. Your cat is found and taken to a shelter, where it may be re-homed. 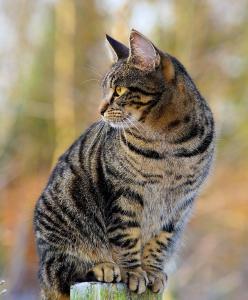 Although indoor cats are less at risk, it isn’t uncommon for them to escape and go missing. In fact, they are more likely to go missing when outside, as it's an unfamiliar environment and they'll be more likely to panic and hide, or run away. Microchipping will help bring peace of mind, wherever your cat spends their time.